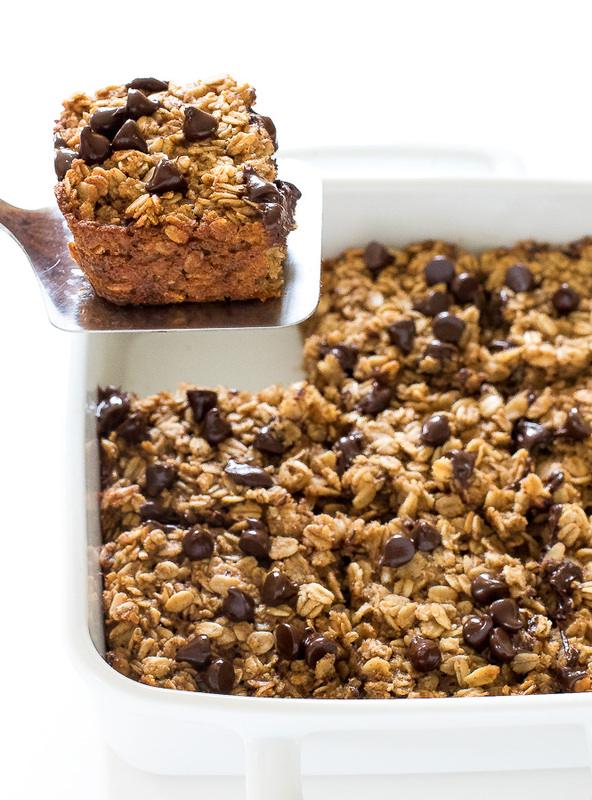 Healthy Baked Oatmeal. 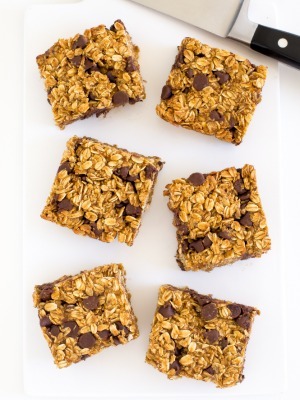 Made with coconut oil and applesauce to lighten it up! A quick and easy breakfast. 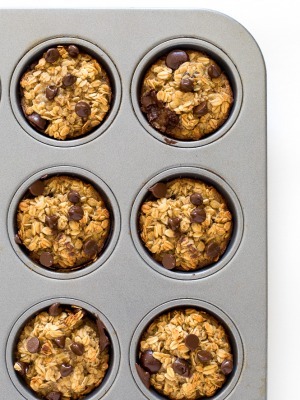 This Healthy Baked Oatmeal is the perfect breakfast on the go. I like making this in the beginning of the week, portioning it out into squares and reheating in the morning. I like to serve the oatmeal warm with almond milk. You can also top it with bananas, yogurt or berries. 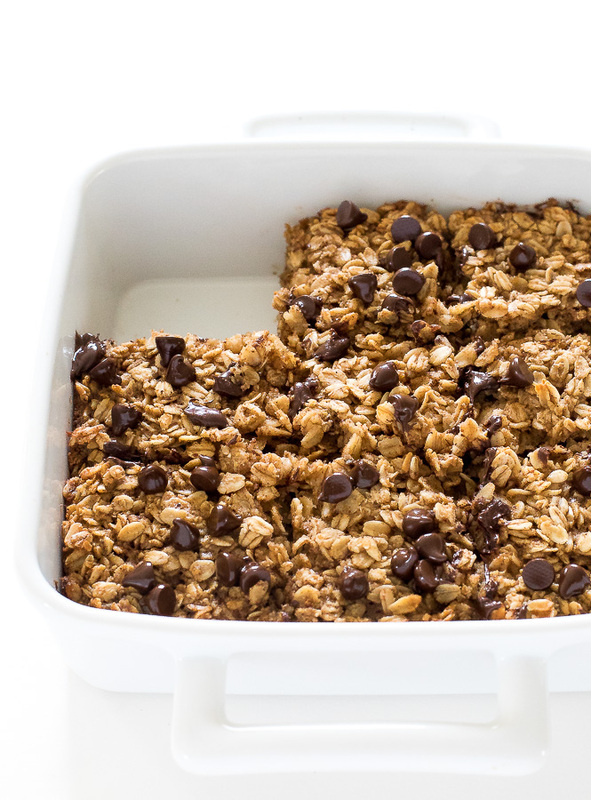 I lightened up this Healthy Baked Oatmeal by substituting coconut oil and apple sauce in place of the butter. I also substituted almond milk in place of full fat milk and reduced the sugar. To amp up the health benefits even more you can add in flax seeds, chia seeds or hemp seeds to the oatmeal. 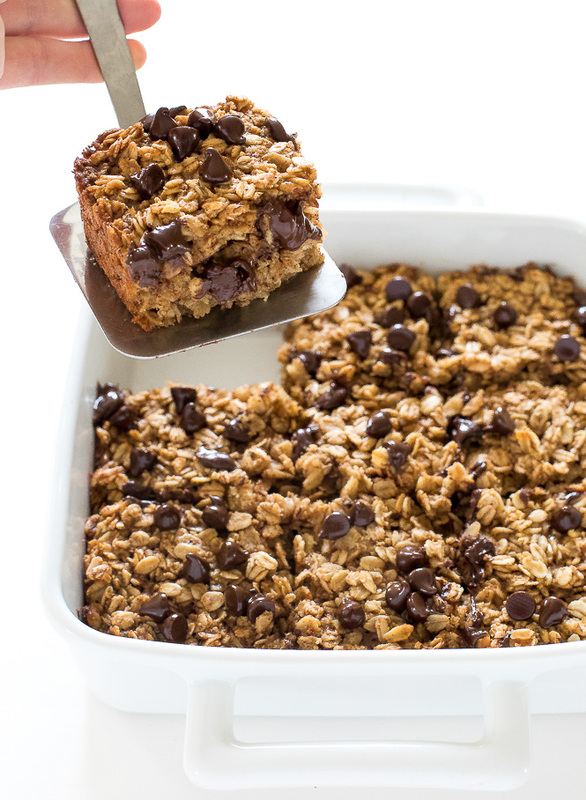 The chocolate chips are optional but for me are always necessary! Enjoy! Preheat oven to 350 degrees. Grease a 9 x 9 pan with non stick cooking spray, set aside. In a medium bowl combine the oats, brown sugar, baking powder, salt, cinnamon, nutmeg and cloves, set aside. In a large bowl combine eggs, vanilla, almond milk, coconut oil and apple sauce. Pour into the prepared pan and bake for 30-40 minutes or until the top is golden brown and is set. Remove from the oven and allow it to cool before slicing.